2017 has been, I'm sorry to say, a year of almost unrelenting misery for families of children with special educational needs and disabilities (SEND). 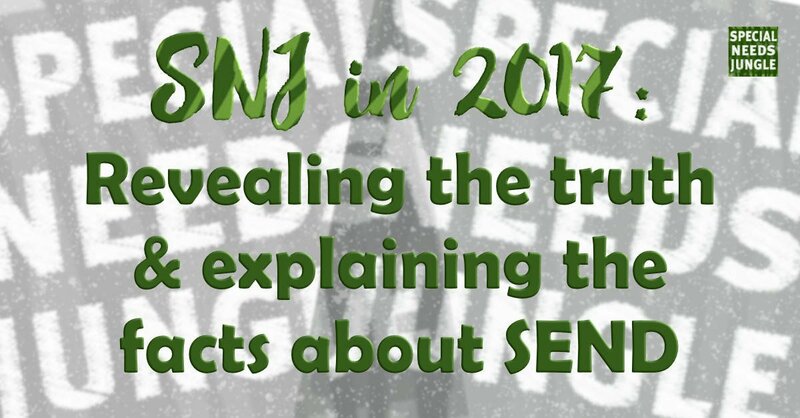 Back in 2014, when the changed were implemented, I thought that by now either SNJ wouldn't be needed or that we could be looking at posts about how well schools, council SEND departments and their colleagues in health and social care were putting into practice the new reforms. But three years on and the situation is worse than anyone could have imagined. The death grip of cuts has tightened, leaving schools without sufficient teaching assistants to provide for children on the SEN (lack of) Support level, whose needs are not protected by a legally-backed Education, Health and Care Plan. It's no wonder LAs are seeing increases in applications for statutory assessments when the delegated budget for SEN, un-ringfenced as it is, is spent on loo roll and other essential supplies. The year wasn't a month old when several surveys came out including one about pupils, parents and teacher satisfaction about SEND in schools. The surveys were published by the Department for Education themselves and it pretty much set the tone for the year. You can read it here. Hard on its heels was the shocking news of children with SEND being "managed" out of schools who decided they either couldn't or wouldn't support them and sponsored academies were the worst culprits. The article, touched on evidence from the Lenehan Review and new data from Education Datalab, which showed, clearly, that results come before children. "Pupils leaving can have a very flattering impact on the league table results of a school – with GCSE pass rates up to 17 percentage points lower in some cases if league tables are re-weighted to include all pupils who received some of their education there, in proportion to how much time they spent there" You can read the article here. The issue is reflected in figures that show more children with SEND are attending independent specialist schools while fewer are getting into academies. And when a child is illegally excluded, can the school be held to account? In February, a report from the support charity, Relate, made grim reading finding that parents of children with learning disabilities are lonely, distressed and under pressure. You can read it here. But February continued with some news that made many (if not all) parents of SEND children see red. The title? YouGov survey: Teachers blame "parental pressure" for misdiagnosis of SEN. Yes, really. Matt Kerr meanwhile had been digging into the SEND Inspections and discovered that all was not as you should expect in his post, Ofsted Local Area SEND Inspectors: The good, the bad & the ugly. On funding, Matt added up the cost of the reforms and where the money - all half a billion and counting of it - had gone and also about the controversial rise of 'banding' to fund high needs students. One of our biggest guest posts came from a parent who took her local authority to the Local Government Ombudsman. It's something that no parent should have to do and few will have the energy to, but if you have been badly treated and want to do so, read this post. Then, the nail in the coffin in October that the SEND system is broken came with three reports all pointing out failings in provision and children being let down. It's to be hoped that this will finally stop the complacency at the top and lead to meaningful action to ensure local areas live up to the letter and spirit of the law in 2018. If they don't we ill be there to shine a light on it. If you have any whistles to blow or personal cases to share, let us know. It's a bit depressing to always talk about what's wrong with SEND and happily, it hasn't all been glum news though. In April, a survey was issued by the DfE that showed two-thirds of parents were happy with their 2015 EHCP experience. While on the face of it this is good news, a closer look at this snapshot reveals that these are EHCPs that started and ended in 2015. This probably excludes all those who ended up being turned down and went (or didn't go) to the First Tier Tribunal. It also wouldn't include those families for whom the process overlapped the beginning and end of the year, whether just because of timing or because they had taken far longer than the 20-week timescale. Finally, it doesn't tell you how good the EHCPs themselves were. One of the best initiatives that grew in 2017 has been Whole School SEND, who have run several conferences that we have participated in and launched a posse of SEND experts who are ready, willing and able to fly into local schools, to assess and improve the provision of SEND teaching in mainstream schools. This is just a small part of what WSS are doing. Check out their website for more details. More good news came in the form of a 50+ strong partnership of disabled children's charities and SEND organisations, the Disabled Children's Partnership, which also includes SNJ. They launched a campaign, the #SecretLifeofUs highlighting what life is like for families affected by a child's disability. Watch out for more in 2018. And another piece of good news came from the SEND Tribunal. A small trial to include health and social care decisions along with educational ones in appeals is being extended after a positive reception. The difficulty in achieving accountability for health and social care input into a so-called 'holistic' EHCP was one of the biggest anomalies of the new system so let's see how far this rectifies it in 2018 when the extended trial gets underway. Perhaps the news that LAs wasted £70 million on fighting - and losing - against parents at Tribunal will finally make them realise that no parent asks for an assessment frivolously. The government also announced £215 million for local authorities to spend on facilities for disabled children. The DfE said it wanted LAs to consult with parents about where to spend it. Has your LA done this yet? Improving autism training in schools: A good practice example. In early 2018, we hope to bring you the answers to the questions you put to the Department for Education last October. ANd next year, we really do want to highlight good practice and great examples of parents and schools working together for the benefit of disabled children. Are you a teacher or learning support assistant who does this every day? Are you the parent or teacher of a child who has seen them succeed despite great difficulties? Tell us about it! Good news is contagious and can raise the vibration of everyone. While we will still uncover injustice, we feel that it's just as important to show the way to those who want to do the right thing but aren't sure how. Please help us to be that change on 2018.